Tucked away on a private lane amidst glorious Peak District scenery, Underleigh House B & B demonstrates the best of English tourism having achieved a Gold Award and Five Star rating by both the AA and Visit England. Magnificent views and fantastic walks from the door. Easily accessible to the area's major attractions including Chatsworth, Haddon Hall, Lyme Park, Castleton, Eyam, Buxton and Bakewell. Recommended by the Good Hotel Guide and selected for an Editor's Choice award as one of the top Walking Hotels (2015 & 2016) and as an Eco-friendly Hotel (2017, 2018 & 2019). We are delighted to have been awarded the ‘Guestlink Visitor Choice – Gold Award’(Guestlink Reviews) and Trip Advisor’s ‘Certificate of Excellence’ (Trip Advisor Reviews) as a result of excellent comments from guests who have stayed with us before. This Derbyshire longhouse, in the heart of Charlotte Brontë’s Jane Eyre country, was built by George Eyre in 1873 and is now the lovely home of Vivienne and Philip Taylor. With its comfortable, homely and country house style, the guest lounge offers a spacious area in which to relax, take tea, study maps or, in winter, just to toast your toes in front of the log fire. In warmer seasons, tables and chairs scattered about the colourful garden might serve a similar purpose. 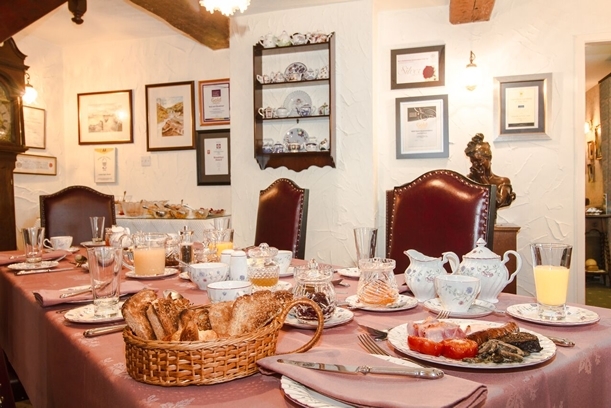 The beamed dining hall is where hearty breakfasts are served, featuring a plethora of homemade and local produce. 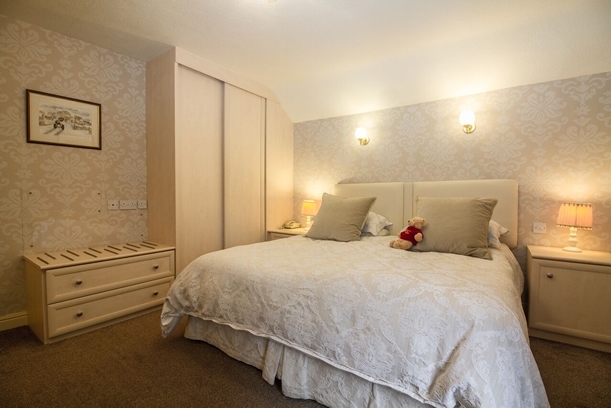 The en suite bedrooms are charmingly decorated and well equipped - with great attention to detail - and three have their own private sitting rooms.